Nexus 5 price and release date: where can I get it? Look. It's the Nexus 5. Buy it... if you want to. Blimey Nexus 5, we were starting to wonder if we'd ever see you. Now that Google has gone official with the Nexus 5, which is the first device to come packing Android 4.4 KitKat, the good news is that you don't have long to wait to get your hands on its chocolatey goodness. As expect, you can buy the Nexus 5 straight from the Google Play Store. It's available for £299 for the 16GB model in black or white, or £339 for 32GB. Carphone was originally selling the Nexus 5 SIM-free. But sadly the retailer has informed TechRadar that it only had limited stock for SIM-free sales and they are now all gone. You snooze, you lose folks. It's still stocking the Nexus 5 on pay monthly deals though, and for no cost if you join a £32 per month, two year 3G contract on O2. That includes unlimited calls and texts and 1GB of data. Oh, you can get it on a 4G contract for £37 per month, which will lump on an extra 2GB of data fun. While Vodafone and EE aren't getting in on the Nexus action, O2 is offering the phone directly, but only in the larger 32GB variant. Available on O2's Refresh tariff, the phone is free on a £32 per month deal, which gives you 600 minutes, unlimited texts and 750MB of data. You can now also get it on PAYG, but don't do that - it's still £429.99, which is a tad expensive when you compare it with how much Google is offering it for. 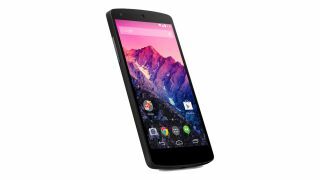 Data friendly network Three is also stocking the Nexus 5 and it has confirmed the handset will be supported by its 4G service which is due to roll out in December. You can bag yourself unlimited data (plus 500 minutes and 5000 texts) on the Nexus 5 from just £29 per month, although you'll need to stump up £49 at point of sale. The 16GB Nexus 5 is also available on PAYG, but at £399.99 it's extremely expensive so you'd be better off going via Google direct. The Nexus 5 has popped up over at Phones4U, but it seems stock is hard to come by, as it's currently listed as 'unavailable'. However, the great news for fans of funny finger shapes is that the Nexus 5 will be appearing back on the shelves shortly - it's just been nabbed by too many hungry fans. The 'secret' arm of Carphone Warehouse (as in, it's owned by the high-street retailer) has the Nexus 5 on most networks, and it's relatively cheap, starting at £17.94 on contract, although sadly there's no PAYG price. A relatively similar deal here - with the phone costing £18 on a two year deal as the cheapest monthly option. You can also pick up the phone SIM Free, but be warned: it's a pointless £454.99 to do it.